Structure of acid-sensing ion channel 1. The epithelial sodium channel (short: ENaC, also: sodium channel non-neuronal 1 (SCNN1) or amiloride-sensitive sodium channel (ASSC)) is a membrane-bound ion-channel that is permeable to Li+-ions, protons, and especially Na+-ions. It is a constitutively active ion-channel. It can be argued that it is the most selective ion channel. The apical membranes of many tight epithelia contains sodium channels that are characterized primarily by their high affinity for the diuretic blocker amiloride. These channels mediate the first step of active sodium reabsorption essential for the maintenance of body salt and water homeostasis. In vertebrates, the channels control reabsorption of sodium in kidney, colon, lung and sweat glands; they also play a role in taste perception. ENaC is located in the apical membrane of polarized epithelial cells in particular in the kidney (primarily in the distal tubule), the lung, and the colon. It is involved in the transepithelial Na+-ion transport, which it accomplishes together with the Na+/K+-ATPase. It plays a major role in the Na+- and K+-ion homeostasis of blood and epithelia and extraepithelial fluids by resorption of Na+-ions. The activity of ENaC in colon and kidney is modulated by the mineralcorticoid aldosterone. It can be blocked by either triamterene or amiloride, which are used medically to serve as diuretics. In the kidney, it is inhibited by atrial natriuretic peptide, causing natriuresis and diuresis. ENaC can furthermore be found in taste receptor cells, where it plays an important role in salt taste perception. In rodents, virtually the entire salt taste is mediated by ENaC, whereas it seems to play a less significant role in humans: About 20 percent can be accredited to the epithelial sodium channel. In cells with motile cilia, ENaC is located along the entire length of the cilia indicating that ENaC functions as a regulator of osmolarity of the periciliary fluid. In contrast to ENaC, CFTR is not found on cilia. These findings contradict previous hypothesis that stated that, under normal circumstances, ENaC is downregulated by direct interaction with CFTR and that, in CF patients, CFTR cannot downregulate ENaC, causing hyper-absorption in the lungs and recurrent lung infections. 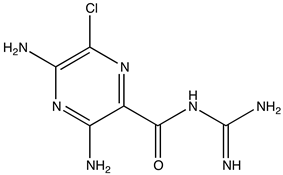 It has been suggested that it may be a ligand-gated ion channel. Epithelial Na+ channel (ENaC)/degenerin family members are involved in mechanosensation, blood pressure control, pain sensation, and the expression of fear. They display a form of desensitization (Roy et al. 2013). Members all exhibit the same apparent topology, each with N- and C-termini on the inside of the cell, two amphipathic transmembrane spanning segments, M1 and M2, and a large extracellular loop. The extracellular domains contain numerous highly conserved cysteine residues. They are proposed to serve a receptor function. Welsh et al. (2002) present three models whereby members of the ENaC family sense mechanostimulation. Their preferred model involves tethering the channel protein to extracellular matrix proteins such as collagens and/or intracellular cystoskeletal proteins such as α- and β-tubulins. Carnally et al., 2008 have presented evidence, based on the X-ray crystal structure, that ASIC1a assembles as a heterotrimer. Carattino (2011) has reviewed the structural mechanisms underlying the function of epithelial sodium channel/acid-sensing ion channel. Opening of the ion conductive pathway involves coordinated rotation of the second transmembrane-spanning domains (Tolino et al., 2011). The second TMS modulates channel gating in response to shear stress (Abi-Antoun et al., 2011). Studies show that the ENaC channel is permeable to Na+- and Li+ ions, but has very little permeability to K+, Cs+ or Rb+ ions. ENaC consists of three different subunits: α, β, γ. All three subunits are essential for transport to the membrane assembly of functional channels on the membrane. The stoichiometry of these subunits is still to be verified, but ENaC is very likely to be a heterotrimeric protein like the recently analyzed acid-sensing ion channel 1 (ASIC1), which belongs to the same family. Each of the subunits consists of two transmembrane helices and an extracellular loop. The amino- and carboxy-termini of all polypeptides are located in the cytosol. Crystal structure of ASIC1 and site-directed mutagenesis studies suggest that ENaC has a central ion channel located along the central symmetry axis in between the three subunits. 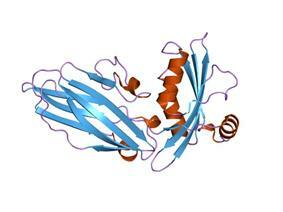 In terms of structure, the proteins that belong to this family consist of about 510 to 920 amino acid residues. They are made of an intracellular N-terminus region followed by a transmembrane domain, a large extracellular loop, a second transmembrane segment, and a C-terminal intracellular tail. In addition there is a fourth, so-called δ-subunit, that shares considerable sequence similarity with the α-subunit and can form a functional ion-channel together with the β- and γ-subunits. Such δ-, β-, γ-ENaC appear in pancreas, testes, and ovaries. Their function is yet unknown. Members of the epithelial Na+ channel (ENaC) family fall into four subfamilies, termed alpha, beta, gamma and delta. The proteins exhibit the same apparent topology, each with two transmembrane (TM)-spanning segments (TMS), separated by a large extracellular loop. In most ENaC proteins studied to date, the extracellular domains are highly conserved and contain numerous cysteine residues, with flanking C-terminal amphipathic TM regions, postulated to contribute to the formation of the hydrophilic pores of the oligomeric channel protein complexes. It is thought that the well-conserved extracellular domains serve as receptors to control the activities of the channels. The vertebrate ENaC proteins from epithelial cells cluster tightly together on the phylogenetic tree; voltage-insensitive ENaC homologues are also found in the brain. The many sequenced C. elegans proteins, including the worm degenerins, are distantly related to the vertebrate proteins as well as to each other. Vertebrate ENaC proteins are similar to degenerins of Caenorhabditis elegans: deg-1, del-1, mec-4, mec-10 and unc-8. These proteins can be mutated to cause neuronal degradation, and are also thought to form sodium channels. The epithelial sodium(Na+) channel (ENac) family belongs to the ENaC/P2X superfamily. ENaC and P2X receptors have similar 3-d structures and are homologous. The exon–intron architecture of the three genes encoding the three subunits of ENaC have remained highly conserved despite the divergence of their sequences. Structure of Amiloride, a channel blocker. ENaC interaction with CFTR is of important pathophysiological relevance in cystic fibrosis. CFTR is a transmembrane channel responsible for chloride transport and defects in this protein cause cystic fibrosis, partly through upregulation of the ENaC channel in the absence of functional CFTR. In the airways, CFTR allows for the secretion of chloride, and sodium ions and water follow passively. However, in the absence of functional CFTR, the ENaC channel is upregulated, and further decreases salt and water secretion by reabsorbing sodium ions. As such, the respiratory complications in cystic fibrosis are not solely caused by the lack of chloride secretion but instead by the increase in sodium and water reabsorption. This results in the deposition of thick, dehydrated mucus, which collects in the respiratory tract, interfering with gas exchange and allowing for the collection of bacteria. Nevertheless, an upregulation of CFTR does not correct the influence of high-activity ENaC. Probably other interacting proteins are necessary to maintain a functional ion homiostasis in epithelial tissue of the lung, like potassium channels, aquaporins or Na/K-ATPase. In sweat glands, CFTR is responsible for the reabsorption of chloride in the sweat duct. Sodium ions follow passively through ENaC as a result of the electrochemical gradient caused by chloride flow. This reduces salt and water loss. In the absence of chloride flow in cystic fibrosis, sodium ions do not flow through ENaC, leading to greater salt and water loss. (This is true despite upregulation of the ENaC channel, as flow in the sweat ducts is limited by the electrochemical gradient set up by chloride flow through CFTR.) As such, patients' skin tastes salty, and this is commonly used to help diagnose the disease, both in the past and today by modern electrical tests. The β and γ subunits are associated with Liddle's syndrome. Amiloride and triamterene are potassium-sparing diuretics that act as epithelial sodium channel blockers. ^ a b Jasti J, Furukawa H, Gonzales EB, Gouaux E (2007). "Structure of acid-sensing ion channel 1 at 1.9 Å resolution and low pH". Nature 449 (7160): 316–322. ^ Palmer LG (1987). "Ion selectivity of epithelial Na channels". The Journal of Membrane Biology 96 (2): 97–106. ^ a b Garty H (May 1994). "Molecular properties of epithelial, amiloride-blockable Na+ channels". FASEB Journal 8 (8): 522–8. ^ a b c Le T, Saier MH (1996). "Phylogenetic characterization of the epithelial Na+ channel (ENaC) family". Molecular Membrane Biology 13 (3): 149–57. ^ Waldmann R, Champigny G, Bassilana F, Voilley N, Lazdunski M (Nov 1995). "Molecular cloning and functional expression of a novel amiloride-sensitive Na+ channel". The Journal of Biological Chemistry 270 (46): 27411–4. ^ Enuka Y, Hanukoglu I, Edelheit O, Vaknine H, Hanukoglu A (Mar 2012). "Epithelial sodium channels (ENaC) are uniformly distributed on motile cilia in the oviduct and the respiratory airways". Histochemistry and Cell Biology 137 (3): 339–53. ^ Happle R (Oct 1990). "Ptychotropism as a cutaneous feature of the CHILD syndrome". Journal of the American Academy of Dermatology 23 (4 Pt 1): 763–6. ^ Loffing J, Schild L (Nov 2005). "Functional domains of the epithelial sodium channel". Journal of the American Society of Nephrology 16 (11): 3175–81. ^ Edelheit O, Hanukoglu I, Dascal N, Hanukoglu A (Apr 2011). "Identification of the roles of conserved charged residues in the extracellular domain of an epithelial sodium channel (ENaC) subunit by alanine mutagenesis" (PDF). American Journal of Physiology. Renal Physiology 300 (4): F887–97. ^ Edelheit O, Ben-Shahar R, Dascal N, Hanukoglu A, Hanukoglu I (Apr 2014). "Conserved charged residues at the surface and interface of epithelial sodium channel subunits--roles in cell surface expression and the sodium self-inhibition response". The FEBS Journal 281 (8): 2097–111. ^ a b Snyder PM, McDonald FJ, Stokes JB, Welsh MJ (Sep 1994). "Membrane topology of the amiloride-sensitive epithelial sodium channel". The Journal of Biological Chemistry 269 (39): 24379–83. ^ "ATP-gated P2X Receptor Cation Channel (P2X Receptor) Family". Functional and Phylogenetic Classification of Membrane Transport Proteins. Saier Lab. Group, UCSD and SDSC. ^ Chen JS, Reddy V, Chen JH, Shlykov MA, Zheng WH, Cho J, Yen MR, Saier MH (2011). "Phylogenetic characterization of transport protein superfamilies: superiority of SuperfamilyTree programs over those based on multiple alignments". J. Mol. Microbiol. Biotechnol. 21 (3-4): 83–96. ^ Saxena A, Hanukoglu I, Strautnieks SS, Thompson RJ, Gardiner RM, Hanukoglu A (Nov 1998). "Gene structure of the human amiloride-sensitive epithelial sodium channel beta subunit". Biochemical and Biophysical Research Communications 252 (1): 208–13. ^ Mall M, Grubb BR, Harkema JR, O'Neal WK, Boucher RC (May 2004). "Increased airway epithelial Na+ absorption produces cystic fibrosis-like lung disease in mice". Nature Medicine 10 (5): 487–93. ^ Grubb BR, O'Neal WK, Ostrowski LE, Kreda SM, Button B, Boucher RC (Jan 2012). "Transgenic hCFTR expression fails to correct β-ENaC mouse lung disease". American Journal of Physiology. Lung Cellular and Molecular Physiology 302 (2): L238–47. ^ Toczyłowska-Mamińska R, Dołowy K (Feb 2012). "Ion transporting proteins of human bronchial epithelium". Journal of Cellular Biochemistry 113 (2): 426–32.